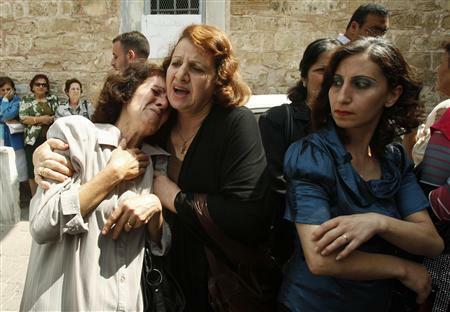 (Photo: Reuters / Ahmed Zakot)Palestinian Christians react during a protest in front of the Saint Porfirios church in Gaza City, against what they say is a forced conversion to Islam July 22, 2012. KHARTOUM, May 13 (Reuters) - A Sudanese court gave a 27-year-old woman until Thursday to abandon her newly adopted Christian faith and return to Islam or face a death sentence, judicial sources said on Monday. Mariam Yahya Ibrahim was charged with apostasy as well as adultery for marrying a Christian man, something prohibited for Muslim women to do and which makes the marriage void. The final ruling will be announced on Thursday. Ibrahim's case was the first of its kind to be heard in Sudan. Young Sudanese university students have mounted a series of protests near Khartoum University in recent weeks asking for an end to human rights abuses, more freedoms and better social and economic conditions. The authorities decided on Sunday to close the university indefinitely. Western embassies and Sudanese activists sharply condemned the accusations and called on the Sudanese Islamist-led government to respect freedom of faith. "The details of this case expose the regime's blatant interference in the personal life of Sudanese citizens," Sudan Change Now Movement, a youth group, said in a statement. President Omar Hassan al-Bashir's government is facing a huge economic and political challenge after the 2011 secession of South Sudan, which was Sudan's main source of oil. A decision by Bashir last year to cut subsidies and impose austerity measures prompted violent protests in which dozens were killed and hundreds were injured.